We are sorry to report the recent death of Nihat Akkaraca, well-known Datça historian and occasional contributor to the Symi Visitor newspaper over the years. A founder of the Datça Local History Group, Nihat documented oral tradition and recorded many stories connected with the region, and with life in Old Datça in the days when the village still had a Greek community. Nihat was an enthusiastic believer in strengthening ties between the communities of Datça and Symi and was one of the driving forces behind the founding of the World Peace Day Swim between the two. 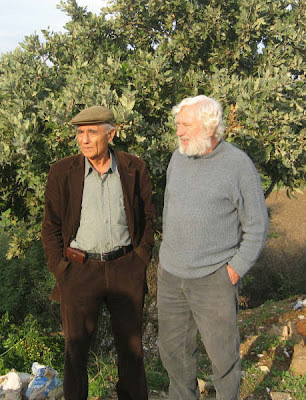 As one of his friends, Alim Erginoglu, says, Nihat believed that Greeks and Turks were two halves of the same apple. He will be missed by many, both Greek and Turk alike, as well as the many friends he made from all over the world over the years. Our sympathies to his family, friends and colleagues at the Datça Local History Group. Please see the tribute written by his long-time friend, Hugo Tyler, which is below, as well as a message of condolence from Lemonia and Lefteris of Syllogos Restaurant. Anyone who would like to add their own messages, please email me at symi-vis@otenet.gr. I was deeply saddened to learn of the death of my friend Nihat Akkaraca, who was such a thoroughly decent and charming man. We first met on September 1st 2003 on the occasion of Symi and Datça’s first joint celebration of World Peace Day, and thereafter no visit to Datça was complete without some time spent in his company. And excellent company it proved to be as Nihat was a mine of information about Datça’s history and traditions. Always happy to put himself out for friends, Nihat would often take me and others on excursions in his car, to Eski (Old) Datça, to his country house at Mesudiye, to ancient Knidos or other local places of interest. On one occasion I found myself squeezed into Nihat’s car with three Greek men, all of whose families had lived in Eski Datça in the days when it was still a mixed Greek/Turkish community. “Those were our fields” sighed one. “Those were our olive groves” cried the second. “That was my grandfather’s house” wailed the third. On another occasion we ‘kidnapped’ an English lady from a pavement restaurant in Datça, much to the surprise of her two companions; roared up the main street and disappeared into the countryside, where we led her down a woody path and she finally got her zakkum. Well, she had said that she wanted to buy an oleander bush, so Nihat took us to a nursery garden. Born in Eski Datça in 1931, Nihat moved to Sinop on Turkey’s Black Sea Coast in search of work; taught himself English and secured a job at a USAF base. He then taught himself electronics and was given a better job by the USAF. Subsequently he opened his own shop, which he ran until he retired to his home area, where he became a stalwart of various local societies and community projects. Clearly he was a believer in education with his elder daughter becoming a lawyer and his younger daughter a lecturer in international relations at an Istanbul University. One of his many interests was local folklore and he regularly contributed articles to a local paper before going on to write a widely acclaimed book. With his first book having gone to a reprint, Nihat was working on a second book at the time of his death. I will greatly miss Nihat, who added an extra dimension to my appreciation of Datça, and I extend my deepest sympathy to his wife and two daughters. Kayıplar pek fazla. Bazen insan endişe etmiyor değil; benzerleri, daha iyileri gelmezse ya, diye. Çalışmak ve umut kalıyor geriye. "Göçebe" blogda da dediğim gibi... İyi ki uzaklara giden ve gördüklerini anlatanlar var. Nihat abiyi anmamak mümkün mü? Hepimiz için büyük kayıptı. Datça benim için Nihat abiyle özdeşti, toprağı bol olsun.